1994 Establishment of the company. 1995 First serial order from the automotive industry. 1996 Change of name F&G Kunststofftechnik GmbH. 1997 New location in Bodenkirchen. 2000 Increase in business volume. Staff increase of 30 employees. 2003 Expanding of the product portfolio. Staff increase of 30 emloyees. 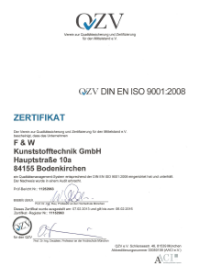 2005 Partner Kunststofftechnik Wiesmayer GmbH involved itself on F&G Kunststofftechnik GmbH. 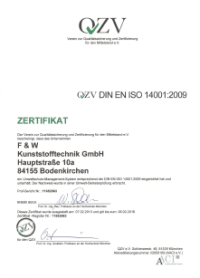 Change to company name in F&W Kunststofftechnik GmbH. 2010 Investing in a Foil-laminate-machine. 2013 Investing in a new Micro-quantities-foaming machine. 2014 Installation of an internal tool construction department for laminate-tools.